Image will NOT have watermark on your print. The Clipper (Parthenos sylvia) is a species of nymphalid butterfly found in South and South-East Asia, mostly in forested areas. 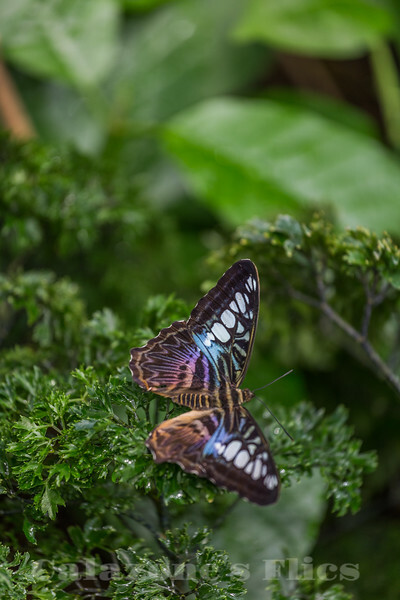 The Clipper is a fast flying butterfly and has a habit of flying with its wings flapping stiffly between the horizontal position and a few degrees below the horizontal. It may glide between spurts of flapping. Male and female. Upperside : ground-colour a bright purple, the subhyaline white spots near the apex of cell in the fore wing more opaque, the broad discal band of large white spots proportionately more basal further from the termen and very irregular, the spots, especially towards the hinder part of the wing, more widely separated, the spot in interspace 5 more acutely triangular and smaller, the two spots above shifted obliquely inwards towards the costa, making the outer margin of the discal band angulate at interspaces 5 and 6. Hind wing: the postdiscal and sub-terminal markings broader and more diffuse than in P. gambrisius, giving a dark shade to the whole of the apical half of the wing.